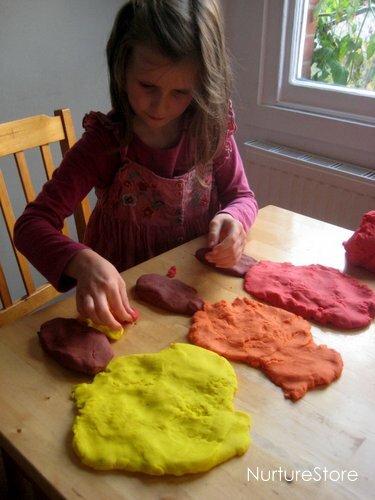 Did you see we made some fall play dough last week? Today we’ve been using it to play some fun math games – great for hands-on, sensory learning. The play dough we used today is the one we made with our fall play dough recipe, and it smells like cinnamon, nutmeg, ginger and cloves – lovely! 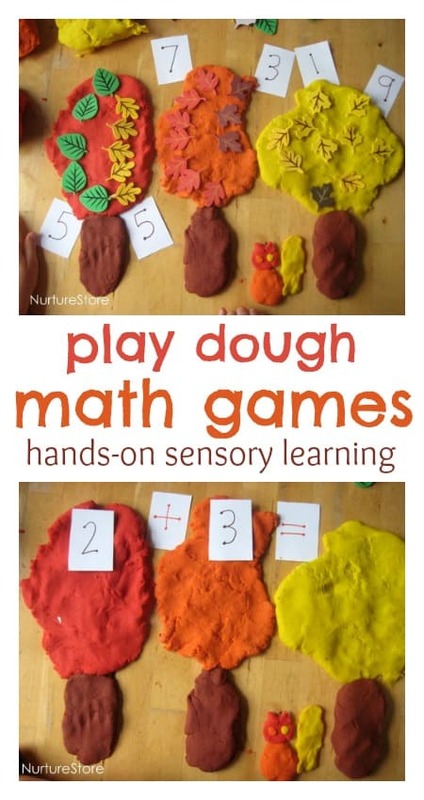 You know how much we love play dough, and I know lots of you use it for sensory and imaginary play, but I wanted to show today how great it is combined with some math games. We are all sensory creatures, especially young children, and using all your senses when you’re working on learning something new really helps. This maths lesson was great to look at, smell and feel – plus it incorporated some imagination and storytelling, which my daughter adores. 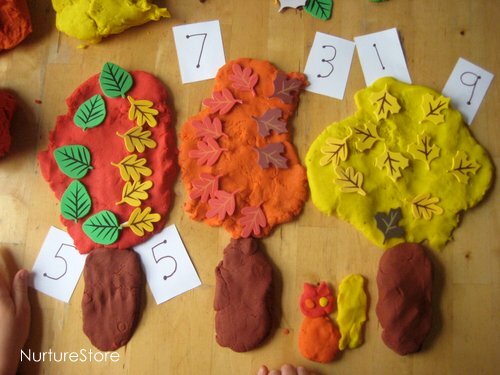 She started off by making herself a forest of autumn trees, and a little squirrel who she said was good at adding up! One area my daughter is working on at the moment is exploring all the ways you can make ten, so we used this as our first game. Her squirrel collected a number of leaves on a tree, which my daughter counted and found the correct number card for. Then she worked out how many more she’d need to make ten, added the leaves, and found the number card to match. It’s important for children to get to know which pairs of numbers are partners to make ten. I call them the number bonds to ten, and my daughter says they’re the numbers that love each other and get married to make ten. 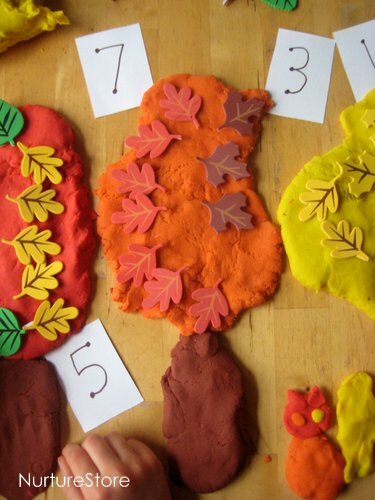 We’re doing lots of hands-on play and practice of these mathematical relationships at the moment, and eventually my daughter will know instantly, but for now she still sometimes needs to see real things that she can count to work out the pairs – so here the leaves are a great visual representation for her. 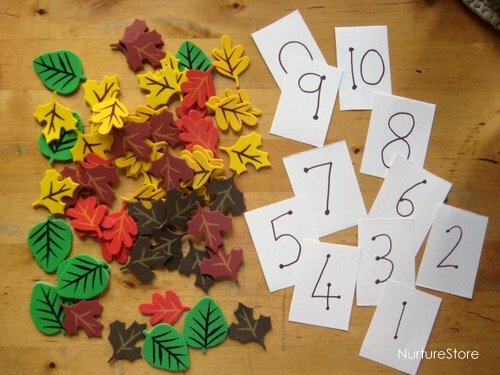 When we were counting out each number, we made sure to stick with the same colour and shape of leaf for each one, which gave us a clear visual picture of the pairs of numbers across our forest – great for visual learners. 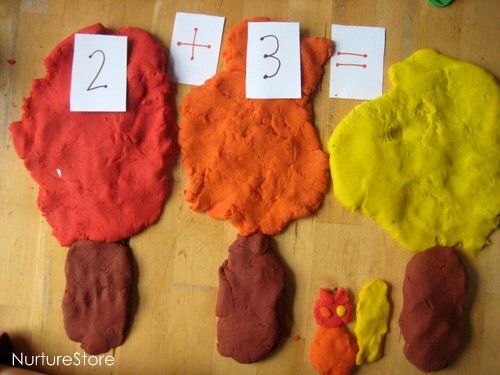 We also used our play dough forest to work on some number sentences. If the squirrel has two leaves on the first tree and three on the second, how many did he have altogether? Again, using the sticker leaves was a great visual cue to check the answers she worked out in her head, or to help with the sums that were trickier. And all the time she enjoyed the hands-on play and storytelling with her little squirrel. If your child isn’t at this stage just yet, to make the math games easier you can work on simply counting. 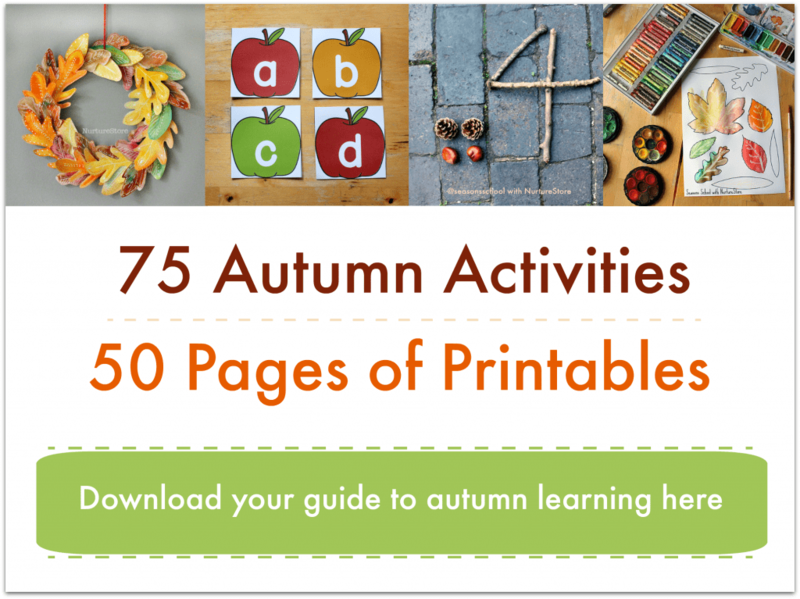 Place a number card by each tree and see if your child can recognise the number and find the matching number of leaves to place on each tree. You could also work on increasing or decreasing your numbers. Place one leaf on the first tree, two on the second, three on the third…. Or start with ten leaves and work your way down. 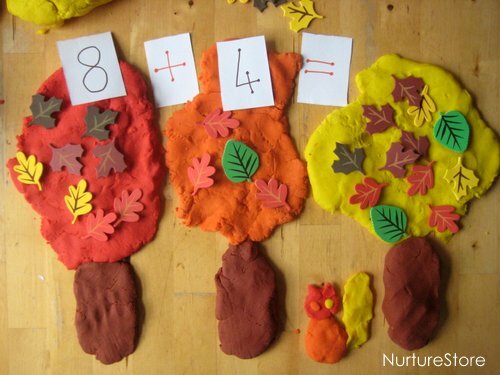 You could also place some leaves on a tree and see if your child can work out what one number you’d have if you added one more. If your child is already confident with this stage, to make the math games harder you can use more complex number sentences. Use bigger numbers, or try some multiplication or division. If you’ve got twenty leaves and you share them fairly between each tree, how many leaves does each tree have?